The first movie is the best, and it's the one most people like best. No disrespect to Paige Turco because she's also a fine actress, but Judith Hoag is the ONLY April O'Neil. And you've got to have Casey Jones in any Turtles film. The original movie is great because it's a bit more realistic and compliments the big, goofy Turtles. The second movie is good, but more cartoony. I don't think the second film was as well thought-out as the first. "Teenage Mutant Ninja Turtles II: The Secret of the Ooze" was a good film, but it did have its faults. The best thing going for it was that it picked up where the first film left off. It did have continuity. What I didn't like was the recasting of April O'Neil, no Casey Jones, and the rather lackluster explanation of how Shredder survived his definite fate from the last film. I do like the brighter filming. This is a fun film, but compared to the first one it's like a snake with its fangs pulled out...no bite. I don't understand why a snapping turtle and wolf (Tokka and Rahzar) were used for the mutant animals instead of the popular characters Bebop and Rocksteady (a boar and a rhino) from the cartoons. However, I did enjoy the original monsters. Where the first two films are great, "Teenage Mutant Ninja Turtles III" killed the franchise. What a boring dud. Shredder was definitely killed off in the second film, and that's fine, but there was a wide cast of TMNT villains to choose from for a third movie. This movie has NO supervillain. Plus the idea of the Turtles traveling back in time is just stupid for this film series (more suited to the cartoons). If the Turtles had to travel back in time, couldn't they go to a place more exciting than ancient Japan? Not even a few brief moments with Elias Koteas reprising his role of Casey Jones could save the beast. 14 years after the third film, a fourth film was released in 2007. "TMNT" was not live-action, but entirely computer-animated. This was a box office success but, in my opinion, it shouldn't be considered a part of this film series. The main cast is entirely different from the earlier films. Although somewhat following continuity from the previous films, it is really more the start of its own series. Plus, it's not live-action! It was just a bad idea to try to continue the original film series in this way. And again, we don't have a supervillain in this film. Since #4, the franchise has been desperately scrapping to revive the Turtles on film with a much-needed reboot, and I normally hate reboots. It will be interesting to see a new Turtles movie in live-action with CGI effects, but the original film will be a hard act to follow. Teenage Mutant Ninja Turtles (1990): I love this movie! It's definitely an action-comedy. I do wish the filming was a little brighter, but other than that this is a very well-crafted film. It is far different from the Turtles comics, cartoons, and toys, but it IS made in a semi-realistic way which makes it more watchable for audiences. If it was a cookie-cutter version of the cartoon, many people wouldn't watch it because it would come off too hokey. They made the right decision in making this a loose adaptation. All the Turtles are hilarious and you can almost believe that they're real creatures! So much personality. Raphael was given a New Jersey accent for this film, which makes him even funnier than his cartoon counterpart. I just love his bad attitude! Casey Jones was played masterfully by Elias Koteas, an actor whose work I enjoy very much in all his projects. Casey was a smaller character in the cartoon series, but in this movie he's a major player. We actually see his face in the movie and he isn't always behind a hockey mask. His voice doesn't sound like Dirty Harry, though. I think the dialogue that Mr. Koteas had in this film was much better anyway. Last, but certainly not least, is Judith Hoag as April O'Neil. In my opinion, she's the ONLY April O'Neil. Actress Paige Turco did a good job in the next two TMNT movies, but just wasn't the same. You can tell the difference between these two actresses. Hoag's character was so well-established in personality that the next portrayal just doesn't fit. The Shredder has to be one of the best live-action supervillains ever played. He is so imposing in his psycho-samurai outfit all decked out with blades. The long cape is cool, too. This Shredder is much more serious than the cartoon version. He's not a funny, or stupid, goof. He is quite serious and articulate. His sidekick is martial arts master Tatsu. I love this character. He's not big on dialogue, but when he speaks you remember it. "Go...play" is still one of my most favorite lines from this movie. Tatsu, important in this film, was a new character that they brought into the Turtles universe. Another interesting note is that all of the Foot Soldiers are real people...not robots like in the cartoons. 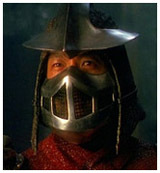 Shredder is the ultimate boss in this movie. There is no Krang the Brain that he takes orders from. Good! I hated that character from the cartoons, anyway. There is no Bebop (the man-boar) or Rocksteady (the man-rhino). These would have been good characters to include in the movie, but they just wouldn't have fit convincingly. We can't forget Splinter the rat, father-figure of the Turtles. He looks kind of gross, but he's still an endearing character. It's funny how he cracks down on the Turtles; always the disciplinarian. And his line at the end of the movie is another favorite: "I made a funny!" with thick Japanese accent. It is kind of sad, though, when he is kidnapped and the Shredder is planning on killing him. We all know that it's not going to happen, but little kids that aren't familiar with the Turtles would probably cry their eyes out. In that respect, the movie sometimes lost its heart. I read in an interview once that Judith Hoag (April) felt the same way about the movie and wasn't really happy with how it all came out. I think it is a great movie, but sometimes the mood does get a bit dark. All in all, this is one of the most memorable movies I've ever seen with an unforgettable cast of characters, great action scenes, and witty dialogue. A must see!